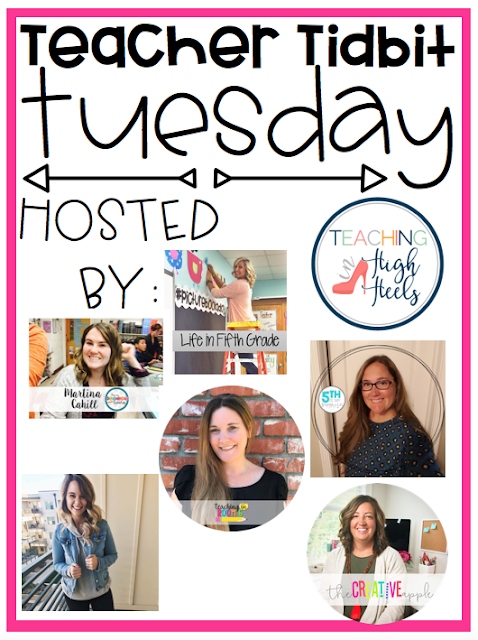 It's Teacher Tidbit Tuesday, friends! Today's topic is all about our first year of teaching. I'm about to enter my 10th year of teaching, which is just crazy to think. I feel like my first year of having my own classroom was yesterday! So let's take a walk down memory lane, all the way back to 2009. I was fresh out of college and trying to find a job during the worst economic time since the Great Depression. There were hardly any teaching jobs available in my area, so I was terrified that I wouldn't be hired anywhere. Thankfully a teacher went on educational leave for a year and they hired me to take her place. 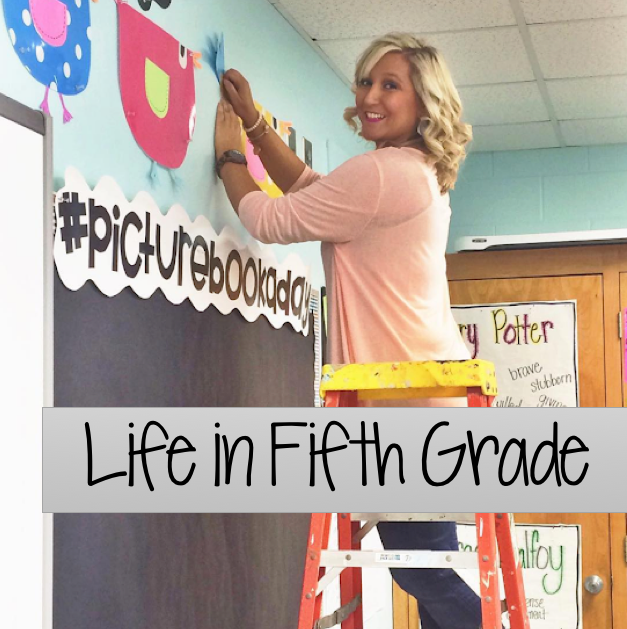 She ended up not coming back to teach, so the job became a permanent position! 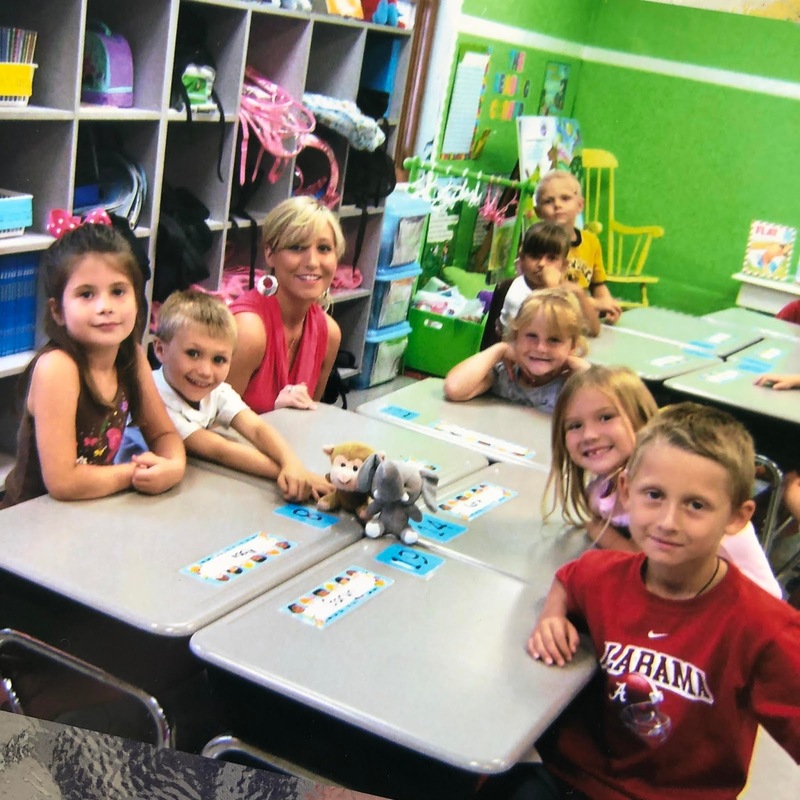 Here I am with my very first group of 1st graders. Look at my young 22 year old self! ***These kids were also my first group of 5th graders when I switched from 1st grade to 5th grade, so I always called them my guinea pig group! 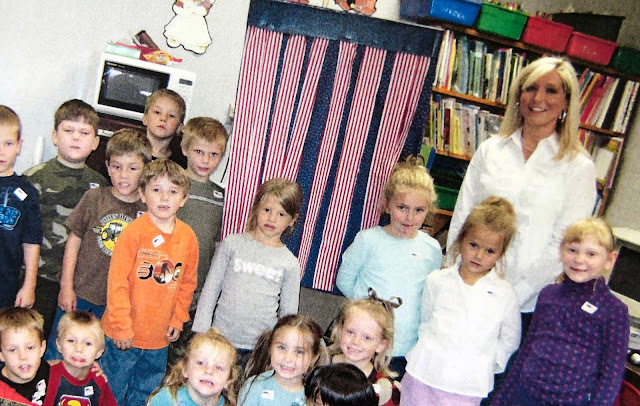 My kindergarten student teaching class. I made a voting booth so we could all vote for the new president of the United States since the 2008 election was during the fall semester of my internship. 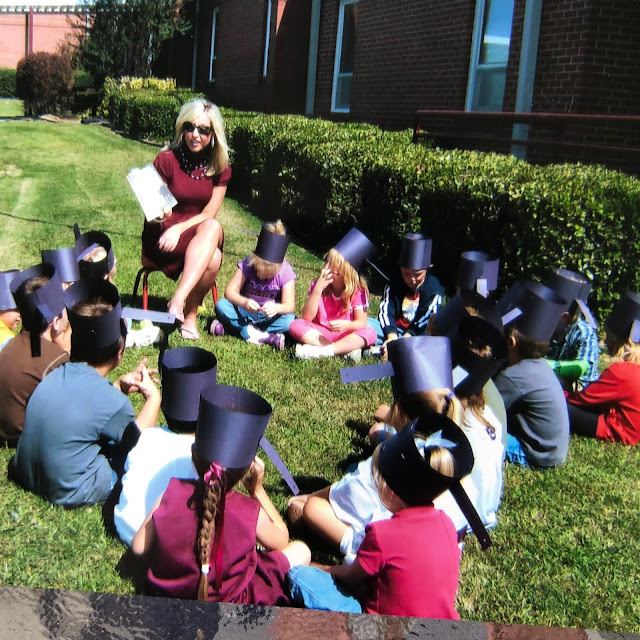 Reading to my student teaching class on Johnny Appleseed day. Look at those fun pan hats! 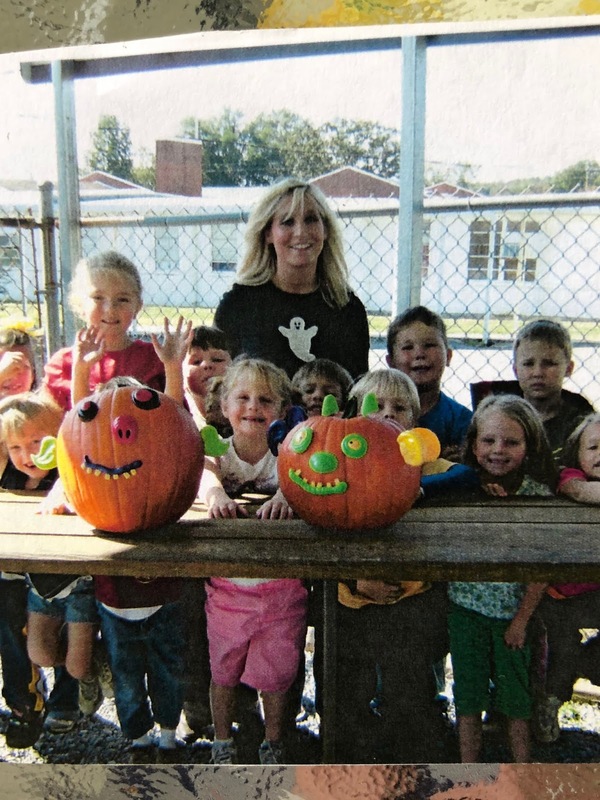 Decorating pumpkins with my student teaching class. My first year of teaching is honestly a blur. I just remember feeling so overwhelmed and confused and unknowledgeable about everything. I hope I'm not alone in thinking that college didn't prepare me for my first year of teaching. I had some great teachers at my university and I learned a lot, but nothing compared to the knowledge I learned after my first year of teaching. I mean, you can discuss behavior plans in a college class all day long, but until you actually have your own group of students that you are responsible for, you aren't going to figure out what works for you and your students. We decided to send our class mascots to the state capital so they could have their picture taken with the governor. We wrote letters, drew pictures, kissed them goodbye, packaged them in a box with a disposable camera, and sent them off on their great adventure while we eagerly awaited their return to see what goodies they brought back to us from Montgomery, AL. My kids eventually forgot about poor Edward and Bella, but I learned a valuable lesson: fun little projects are great, but communication is key! 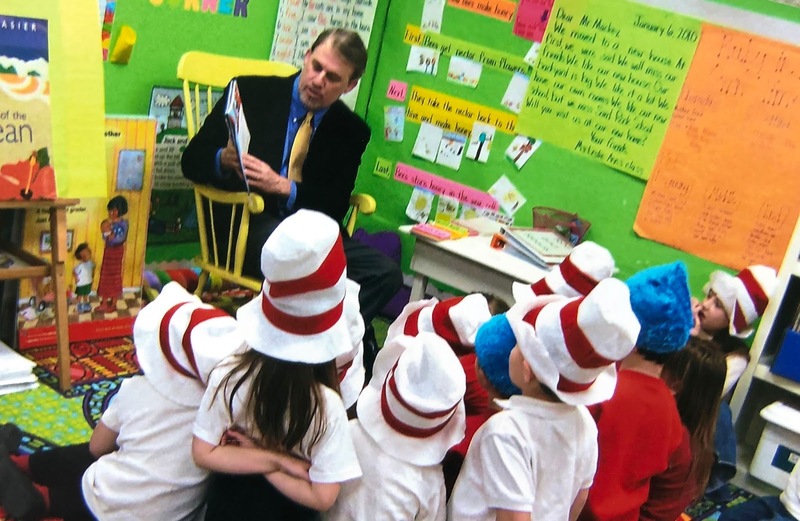 Case in point: later that year, during Dr. Seuss week, I email our district representative, Richard Lindsey, and he came to read to our class. Another piece of advice! When you have a guest reader come read to your class, pick out a book ahead of time. I decided to let the kids pick which Dr. Seuss book they wanted him to read and they picked The Cat in the Hat Comes Back. If you don't know that one off hand, trust me, it's looonnnngggg. I'm pretty sure he was sneaking peeks at his watch. LOL! For Johnny appleseed day, we were apple obsessed! 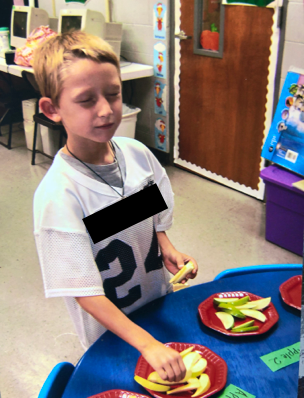 I had planned so many fun apple related activities, which included an apple taste test where each student came up and tested out different types of apples to pick which kind they liked best. This activity was going SO WELL. I mean, look at this sweet kid's face! You know what went wrong? I didn't remember that we were having a scheduled fire drill. So when the bell started ringing right in the middle of our taste testing, we all had to evacuate the building and head the the baseball field on the other side of campus. By the time we returned to the classroom, our apples looked less than ideal. #fail. During one of our reading stories, we learned about the Mexican culture, so I created a fiesta for our class. I brought the food to school and had even got brightly colored paper plates and napkins and a piñata that the kids were SO excited about! As I started to pass out plates and drinks, I realized I had forgotten all about drinks and cups! I had to quickly scrambled to find a enough drinks for everyone because I hadn't thought about that small detail! There are COUNTLESS other fails from my first year of teaching AND every other year. I know it may seem like everyone has everything figured out when you start looking at blogs and social media, but they don't. You're just seeing a highlight. Everyone scrambles at some point and every teacher has been a first year teacher at some point. You aren't alone. 1)Your classroom rules. Post them and inform the kids of what you expect. 2) Your behavior plan. Research what you want your behavior management strategy to be. 3) Your schedule. Think about it and then write it down and fill in what's going to occur in those time slots. How is your day to day going to be? What's your morning routine look like? After a few weeks in, don't be afraid to change what isn't working, but don't start off the year without some sort of routine. The kids will behave better if they know what their day will consist of, even if you end up changing it later on. 4) Map out how you want your classroom to be designed. Think about the different areas in your classroom that you want to create like your classroom library, different places for centers, your small group meeting area, etc. 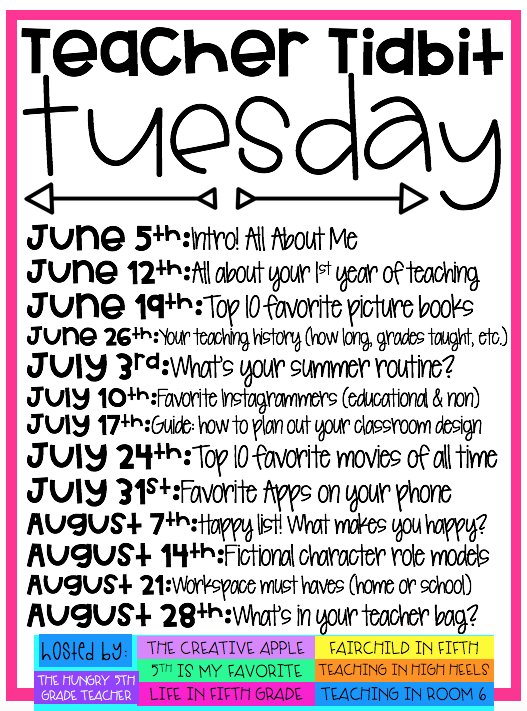 I'm a firm believer in planning out your classroom design and then going back in and changing it a few weeks into the school year if something isn't working right. 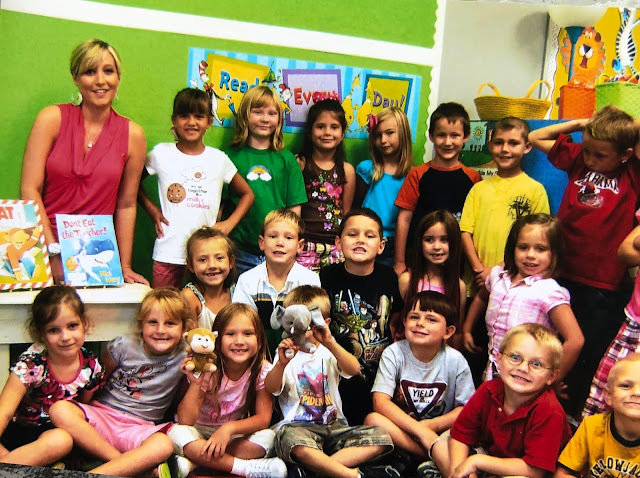 You will be amazed at how important the flow of the classroom is! That's it for today's Teacher Tidbit Tuesday post. Here's what topics are coming up. This past year was my first year teaching. I taught fifth grade, which I swore I would never do. I taught reading/social studies and my partner taught math/science. We switched classes throughout the day. My piece of advice to any first year teachers would be to have a voice. Don’t let people run you over. I had an extremely rough year just because of how my partner treated me in front of my students (like a small incompetent child). Being a first year teacher there was a lot that I wasn’t aware of, like every teacher being responsible for f&p testing their homeroom students. I was told it was my responsibility since I was the ELA teacher. I spent months of my instructional time F&P testing 50 students, three different times throughout the year. I didn’t find out until later in the year that, before I was hired, everyone was told to complete their own. My partner managed to manipulate me in many other ways as well. Luckily, this year I get a fresh start with a new partner and I’ll be teaching math/science. I’m extremely grateful to have a principal that listens. Make sure you reach out to people for help, even if you think it is something silly. My principal was curious as to why I waited so long to talk to her. I just wasn’t sure how things worked in the beginning. I’ve learned so much from my first year and I’m ready for year 2! Wow! It's a good thing you finally spoke up. I was bullied by the teacher next door to me my first year and the next year my principal moved me away from her. Otherwise there is no way I could have stayed! It is really important to communicate to others what is going on, especially to your admin. I’m looking behavior management suggestions. I’m going into my first year of teaching. I’ll be teaching 6th grade reading and science...I don’t want them to walk all over me! Looking for what works for you all!